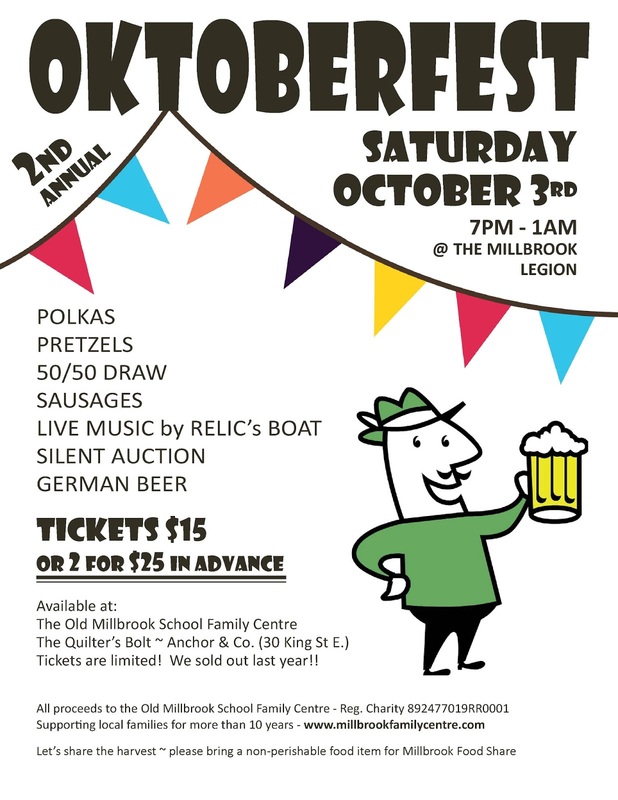 Old Millbrook School EarlyON Child and Family Centre: Oktoberfest is almost here! Roll out the barrel, and we'll have a barrel of fun! Join us at the Millbrook Legion starting at 7pm on Saturday October 3rd for our 2nd annual Oktoberfest. Pretzels, polkas, pints (sorry kids, this event is only for grown-ups!) and more! Live music will be provided by Relic's Boat. Tickets are $15 each or in advance for 2 for 25$. If there are any tickets left over, they will also be available at the door. Pick up your tickets at: The Old Millbrook School Family Centre, The Quilter's Bolt/ Anchor & Company, OR, at the Millbrook Zucchini Festival on Sunday September 13th (from 12:30 'til 4:00, next to Needler's Mill). Last year we sold out, and it proved to be our most successful fundraising event of the year! Please do come out and support us, and if possible, consider donating a silent auction item. Thanks to the Millbrook Legion for their support, and to the other kind local businesses who have donated items!